Skadden, Arps, Slate, Meagher & Flom Llp is an organization that offers necessary legal advisory service making their focus on several financial, corporate and even industrial sectors. The practicing area of the firm includes finance, corporate finance, litigation, employment and labor, political law, tax, insurance, private equity, antitrust, corporate, legislation, regulatory etc. The company was established in 1948. They have their branches across twenty-two offices. Marshall Skadden, Les Arps and John Slate established the firm. They have a team of highly educated, qualified and skilled lawyers for the purpose. They even offer crucial functions regarding retention and development of attorney, initiatives by women etc. There are currently 0 consumer reviews about Skadden, Arps, Slate, Meagher & Flom Llp available. Share your review. Please take a note that you are about to post a public review about Skadden, Arps, Slate, Meagher & Flom Llp corporate office on CorporateOffice.com. This review will be public, so please do not post any of your personal information on this website. 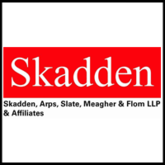 If you would like to contact the corporate offices of Skadden, Arps, Slate, Meagher & Flom Llp, please use their contact information such as their phone number, website, and address listed above to contact them. However, sometimes staff from Skadden, Arps, Slate, Meagher & Flom Llp headquarters do read the reviews on this website.